Emergency personnel work at the site of where a Valley Transit bus engine set on fire near Alamo on Sunday. ALAMO — Valley Transit bus engine set on fire while on the 1300 block of W. Frontage Expressway 83/I2, shutting down the road for 30 minutes but leaving nobody injured. At approximately 2:30 p.m., Alamo Police Department responded to the call. 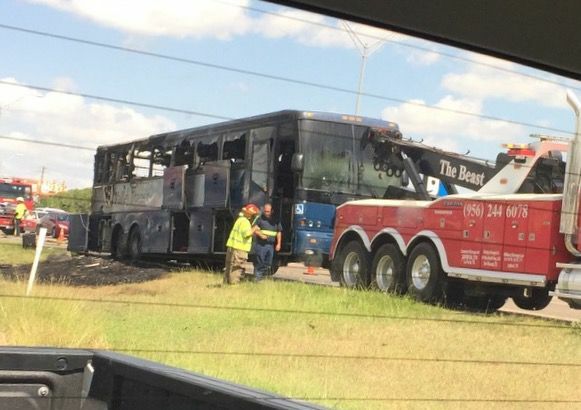 “The bus driver had no serious injuries and there were no passengers on the bus,” Alamo Police Chief Arturo Espinoza said. Valley Transit Company couldn’t be reached for comment.